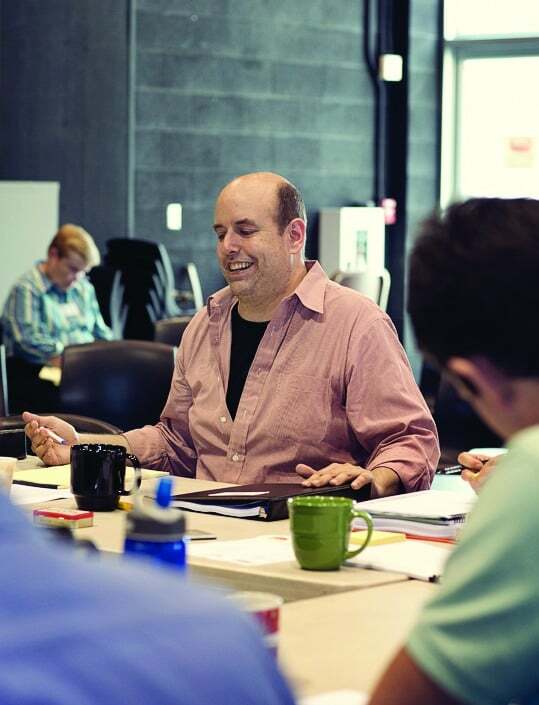 Tony Award-winning director Christopher Ashley attends a meeting to discuss his new rock ‘n’ roll musical “Chasing the Song.” Photo used with permission from The La Jolla Playhouse. With the 2012 Tony Award-winning Broadway play “Memphis” under his belt, Christopher Ashley, artistic director of the La Jolla Playhouse, returns to the scene to direct yet another smash musical. Ashley opts to follow the period of rock ‘n’ roll music following the Vietnam War with his play “Chasing the Song,” which reflects his and his team’s penchant to explore the evolving American genres of music through time. The play will run from May 9 to June 15 at the playhouse. Guardian: What can you tell us about “Chasing the Song”? Christopher Ashley: For me, this play is a reunion of sorts; this is the team [who] created the musical “Memphis” getting back together. But this musical [“Chasing the Song”] is about a mother and daughter who are both breaking into the male-dominated world of making music in the 1960s. And it takes place right before the British Invasion of The Beatles when they came over [to the U.S.]. It’s rock ‘n’ roll; it has a big dance life. But it’s also about a glass ceiling, how music gets written, how people express themselves through music and [about] cultural change. Especially from the Vietnam War, American culture is changing, and the musical looks at that change through a mother-and-daughter group of Jewish songwriters. G: Who are the mother and daughter characters, and what are their respective backgrounds? CA: Edie, who is the mother, owns a music-publishing business at the epicenter of new American music writing in the 60s. She chose to have a work life instead of being a stay-at-home-mom, and her daughter Jinny shows up really wanting to be a songwriter as well, but she’s been turned down all of her life, so her last choice is to work for her mom, who is also the only one willing to give her a shot. G: What was the process of creating the musical? CA: In terms of the process, this is a musical that began its life in a concert reading in our DNA series a year ago. It really just exploded off the page, which led me to spend the last few years working it out. G: What sorts of discussions do you hope the audience will have after seeing this play? CA: We have talkbacks every single night. This play is about the 1960s and music and gender, and I hope that the discussion is about [how] the world is really staged and in what ways civil rights issues and equality issues stand today. G: You’ve been a part of many productions. In what ways has this differed? CA: I think this one has been about the artists and audience together finding a piece and reworking it and discovering it straight through the route. This time, it’s all about that process and discovery about what is working and not working from an audience. G: What were some of the obstacles you faced going into the production? CA: Finding the cast has been complicated because we need them to act, dance and play an instrument really well — they’re the band themselves. It’s a lot to ask for from one person, but the casting process was heroic.